Responsible for leading the team’s very first jet exhibition flight, flying the Grumman F9F-2 Panther in front of a sizable crowd of onlookers at Beaumont, Texas, Magda was every bit the consummate and professional pilot his previous superiors claimed he was. His assignment with the Blues was not to last, however. When mid-1950 came around, the Department of the Navy made the decision to dissolve the Blue Angels team when all pilots volunteered for combat duty. Chief of Naval Operations Admiral William Fechteler then ordered that the Blues return all their aviators to active flight duty. This was a fairly decent idea on the part of higher ranking officers, especially as the majority of Blue Angels pilots came from carrier-based fighter squadrons deployed throughout the Pacific Theater during WWII. They would be able to function as both leaders to newer aviators who would replace the scores of former pilots who had resigned their commissions after 1945, and as an efficient, experienced and versatile aerial strike team. As an added bonus, Navy public relations would get a significant positive boost because of the willingness of the demonstration pilots to reenter the fight of their own volition. LCDR Magda, along with Lieutenant Arthur Ray Hawkins, the Navy’s 10th leading ace of WWII and a current Blues pilot, were reassigned to Fighter Squadron 191 (VF-191), known as “Satan’s Kittens”. Magda would function as Commanding Officer of VF-191, while Hawkins would be his Executive Officer, the second-in-command; the remaining Blues pilots would join them there as well. VF-191 would be assigned to Air Group 19, which in turn was attached to the recently re-commissioned USS Princeton. The plan called for the carrier to steam to the Korean coast where it would link up with Task Force 77 to launch jet combat air patrols, support Marines on the ground who were fighting their way from Chosin to Hungnam, and to effect airstrikes on Chinese and North Korean positions. For the first time in its history, the Blue Angels were off to war. 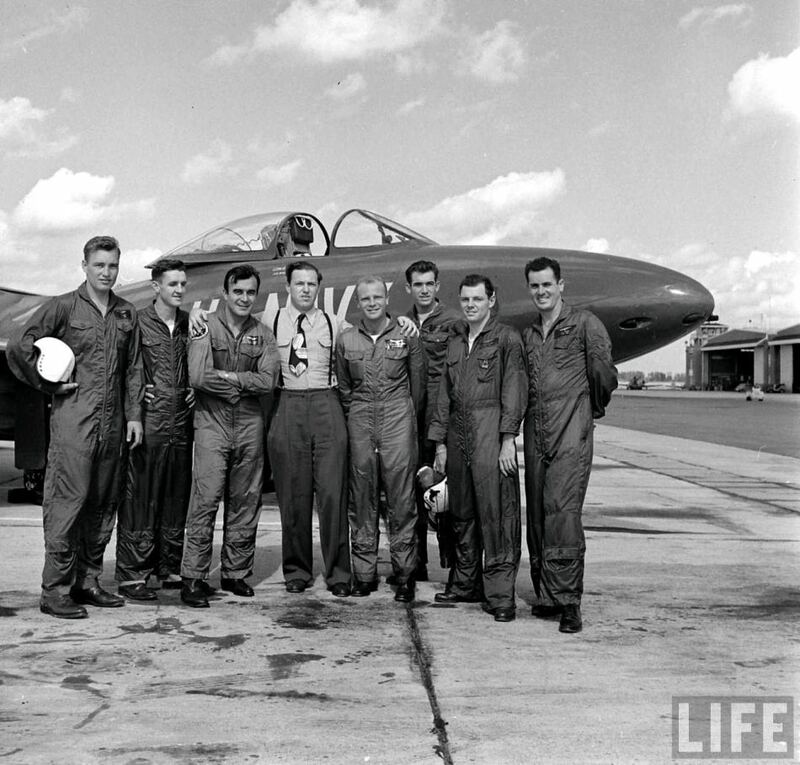 After concluding their last airshow of the shortened 1950 season at Dallas on July 30th, the team packed up and flew out the very next day to San Diego to deliver their jets, and then reported to NAS Moffett Field in San Francisco. They were immediately processed in and were shown their new assigned aircraft. Satan’s Kittens would be flying F9F-2B Panthers, essentially the same aircraft they flew in their previous incarnation as Blues demonstrators. However, these jets were heavier with a slightly reduced range, thanks to the inclusion of weaponry that was otherwise stripped from the demonstrators. Time was of the essence, and as VF-191 was composed mostly of F8F Bearcat propeller pilots who had just returned from a cruise aboard the USS Boxer, Magda and Hawkins had to get their pilots ready to rock within just a few months before their carrier was scheduled to deploy. 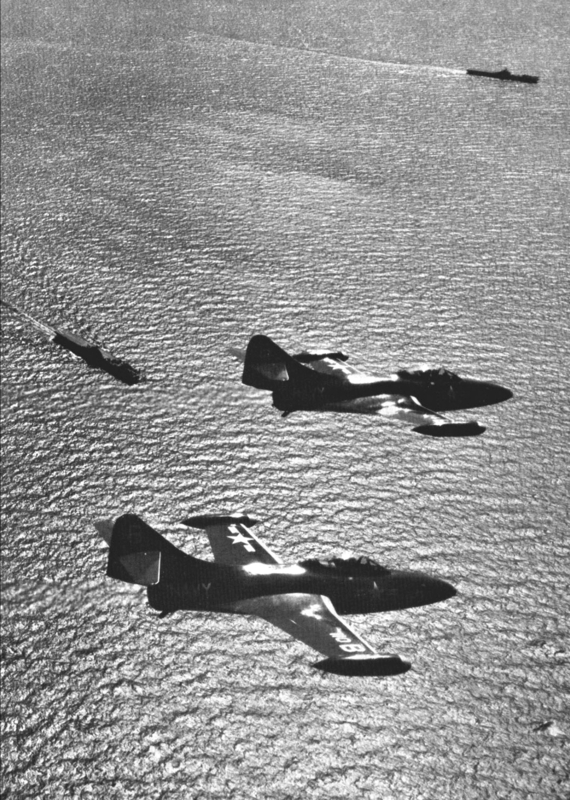 Between late August and mid-October, the former Blues pilots led the rest of VF-191 in getting checked out in the F9F-2B, and between October 16th and the 20th, were able to perform successful carrier qualifications aboard the Princeton off the Southern Californian coast. On November 7th, VF-191 took their aircraft over to NAS Alameda where the Princeton was berthed and awaiting the order to move out. Panthers were loaded by crane aboard the flattop, and the ship steamed for Hawaii, en route to Korea, where the squadron’s pilots were now waiting to join the ship on its cruise. Regardless, they were still flying in harm’s way. In March of 1951, VF-191 was stunned when word got back to the carrier that a Panther wouldn’t make it back. Johnny Magda, leading a low-level strike with rockets and guns on communist infantry positions, was hit with anti-aircraft fire. Pulling out of the strafing run, his wingmen saw his jet spew smoke and then light ablaze. He nursed the mortally wounded aircraft out to sea, near Tachnon on Korea’s east coast, but tragically, it went down and Magda was lost. He was awarded the Navy Cross, the Navy’s second highest medal for valor and bravery (to the Medal of Honor). In 1951, the Blue Angels were stood up once more as the Navy’s sole flight demonstration team, flying the F9F-5 Panther. They never were returned to combat duty again.